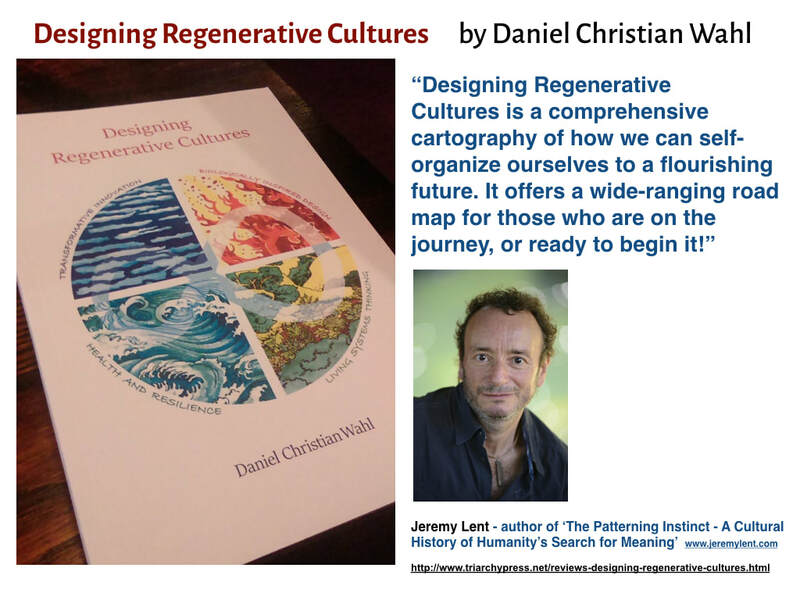 "Daniel's book Designing Regenerative Cultures is a wonderful and well-referenced primer for a new paradigm." "Clearly our ways of thinking have gotten us in some trouble--here are concrete suggestions for some new habits of mind that could help us climb out of our hole!" "Designing Regenerative Cultures provides a clearly-written and well-articulated set of guiding principles for organisations and individuals seeking to shift their thinking into a systemic and regenerative mode of design consciousness. Building his narrative on the well-establish foundations of systems thinking and complexity theory, Daniel also provides extensive case studies and examples of transformative design which can inspire us to change our pathways to lifestyles and business strategies which vitalise our ecosystems, both natural and economic. I can certainly recommend his book for the participants of Capra Course, those who are interested in how we can actually put systems thinking and a deeper approach to sustainability into practice, and indeed to the many students around the world who wish to contribute to the transformation of design, and who indeed are already starting this movement." Professor Ioan Fazey, Centre for Environmental Change and Human Resilience, University of Dundee. "Daniel Wahl... has the capacity to explain complex and subtle subjects such as systems theory, regenerative design, holistic management, biomimicry, the circular economy, quantum theory ... and much more, succinctly. however care-worn and cynical the reader may feel." Maddy Harland in Permaculture Magazine. "Designing Regenerative Cultures has gained international acknowledgement for its pragmatic approach to the subject, reframing and questioning the current approaches to the challenges that humankind is currently facing with deeper understanding of the possible solutions surfacing with regenerative design." This is the core realization of Rob Hopkins (Transition Handbook) and David Fleming (Lean Logic) as well, but Wahl’s book gets to the assembly language programming, explaining how ecological literacy and the social, technological, and entrepreneurial skills required for the transition are the entry point that leads to everything else. Arguably ecological literacy is already the foundation of much that is new in the world of industrial design — it is called biomimicry. Biological and ecological design intelligence is starting to reinvent the way we design communities, businesses, cities, and industries. This book gets out in front of that with the larger picture. We need to do these things, now, or we may not be here in another century. If we are going to get this right, it will begin here." Reviewed by Albert Bates, Ecovillage and Permaculture Pioneer, Right Livelihood Award Winner, and author of Climate in Crisis. It is of value to ministers of government, managers of corporations, administrators of non-profit and educational organizations, labor union and religious stewards, and every single citizen planning to be alive in five years and beyond." "Daniel Wahl has compiled a great deal of useful information in a masterful synthesis. That alone is a significant accomplishment, but he’s given us more than that. Designing Regenerative Cultures describes the doorway to a possible, indeed, necessary future. We are not fated to the dystopia in prospect. We have, as he writes, the capacity to design and to organize our societies to protect, enhance, and celebrate life. The blueprint was there all along. The awareness of our possibilities is growing. The art and sciences of ecological design are flourishing. The choice, as always, is ours and that of those who will follow." From the Foreword by David Orr (environmentalist and Paul Sears Professor of Environmental Studies and Politics at Oberlin College and a James Marsh Professor at the University of Vermont). “This book is a treasure for everyone who is looking for a guide to more sustainable living and a roadmap for re-designing our societies , regenerating our communities , cities and societies in harmony with natural systems and our home planet. Author Daniel Wahl has deep experience to share and his knowledge in this beautiful book will help all those aspiring to be responsible global citizens working for our common future." 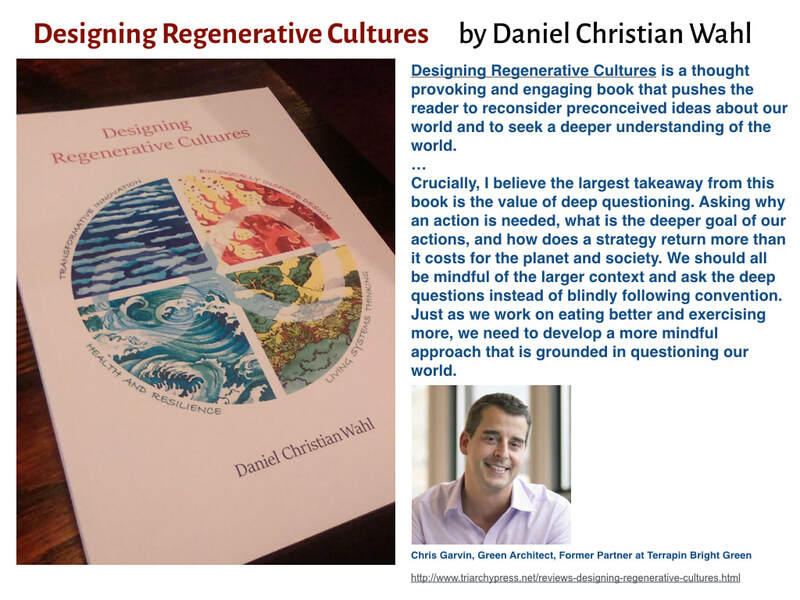 "Daniel Wahl’s Designing Regenerative Cultures provides an exhaustive review of current thinking on our global challenges as well as a refreshing approach to how we can “live into the questions” that will help us create a beautiful future. Anyone working in sustainability or social innovation will find this book to be a tremendously useful reference and provocative guide for framing regenerative solutions. It is a wonderful blend of passionate vision and practical insight." "The world is converging on integration and systems thinking, and regeneration of the world is the battle cry of any sentient being in the 21st century. Daniel Wahl provides good insights and inspirations on the index of possibilities -in mass scale regeneration of nature and society." Marcin Jakubowski, PhD, Founder & Executive Director of Open Source Ecology. Designing Regenerative Cultures is a wide ranging synthesis of key knowledge to take us into a more resourceful 21st Century. The book brings forth multiple perspectives on the ultimate challenge of our time. This living material will help one get beyond the bread and circus approach that the mainstream media is foisting upon us, and thereby subtlety turning us into bloated modern Romans without a clue on what really matters, let alone the power to create what matters. Shifting from a narrative of separation and scarcity, to interbeing and abundance opens the conceptual door to the next phase of the human enterprise. Read and absorb this powerful treatise, and learn from the dynamic context Daniel Wahl has created with the publication of his new book. Christopher Zelov conceived and produced the award winning film 'Ecological Design: Inventing the Future'. Recent projects include: A Visit With Magnus, City 21, and Design Outlaws. "Life on the Planet has sustained itself for billions of years by continually regenerating itself. Our modern industrial culture has interfered with these natural processes to the point of causing massive extinctions of species and threatening our very survival. This book is a valuable contribution to the important discussion of the worldview and value system we need to redesign our businesses, economies, and technologies — in fact, our entire culture — so as to make them regenerative rather than destructive." Fritjof Capra, author of The Web of Life, coauthor of The Systems View of Life: A Unifying Vision. ​"To me as a life-long activist nourished on systems thinking and Buddhist teachings, this is one of the most intellectually exciting and soul stirring books I’ve read in years. I had the sense of drinking it, with pleasure and surprise, not having known what I’d so thirsted for. By starting with questions and keeping to questions throughout, Daniel engages the reader, and by example frees her from striving for, or pretending to know, any final answers. This approach -- in itself a rare lesson in systems epistemology — invites trust, openness, and a restructuring of the mind. Among the gifts for which I am especially grateful are these: Conceptual tools for perceiving and experiencing our mutual belonging , and especially what I’ve come to call the great reciprocity at the heart of the universe. The ways Goethe, Bortoft, Bateson, Maturana, and Varela are brought in, and key insights mediated with economy and clarity. The abundant evidence of the Great Turning, the manifold transition underway to a life-sustaining culture. And, especially valuable to those of an apocalyptic bent like myself, the 'adaptive cycle' of resilient systems, showing that at 'the edge of chaos' comes opportunity for the emergence of greater complexity and intelligence. These are but a few of the ways in which this remarkable book will enrich my thought, my teaching, and my life in this turbulent world of ours." Joanna Macy, environmental activist, scholar of Buddhism, general systems theory, and deep ecology and author of World as Lover, World as Self and numerous other books. "I’m conflicted here. 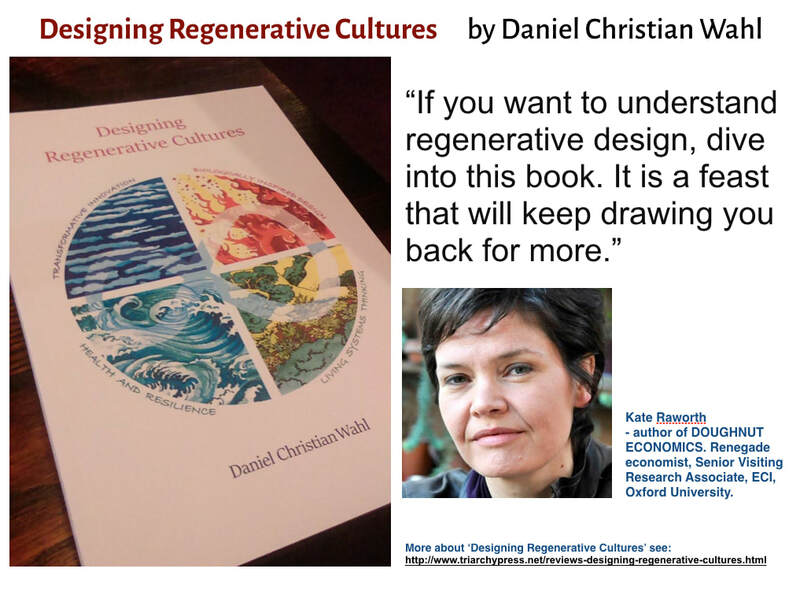 At one level, I really enjoyed Daniel Wahl’s Designing Regenerative Cultures, and I know that the majority of Resurgence & Ecologist readers will too. At another, it made me grind my teeth in frustration! Wahl’s new book lays bare exactly what’s wrong with today’s economic orthodoxy (and the deeper worldviews that lie behind it), before pointing the way to today’s “regenerative solutions” – in the worlds of design, culture, agriculture, economics and finance. Along the way, the reader gets to know many of the key figures who feature so prominently in Wahl’s own personal pantheon – as he says, we should indeed be drawing down on more than 40 years of deep wisdom and “whole-systems understanding”. It’s inspiring stuff." "I am not surprised that this seminal book has been so enthusiastically endorsed by the likes of Fritjof Capra, Hazel Henderson, Joanna Macy and David Orr. If you only read one environmental book this year, this should be it. ... One of the most interesting features of the book is the number of questions – over 250 – and the injunction that we should live these questions rather than impose answers that do not do justice to the complexity of our overall situation. The four main elements, illustrated on the cover, are transformative innovation, biologically inspired design, living systems thinking, and health and resilience. ... Daniel gives many potential avenues for progress involving redesigning economics based on ecology, creating regenerative and circular economies, shifting from quantitative to qualitative growth, and co-creating regenerative enterprises. Consistently with his own advice, Daniel has been active in Majorca, using the very processes and questions set out in this book. I am sure he is right that we need to start on a local and small- scale, and indeed a great deal is already going on although under- or unreported. ... We can all ask ourselves how we can be the change we want to see in the world and work with others in nurturing the seeds of a new and life-enhancing culture. In this respect, Daniel has written an essential handbook." David Lorimer, author of Thinking beyond the Brain and Science, Consciousness and Ultimate Reality; programme director of the Scientific and Medical Network; Vice-president of the Wrekin Trust. "Contributing a cogent intellectual contribution on the meaning of life is not the easiest thing to accomplish. ... Designing Regenerative Cultures is a symphony of many of the most important ideas that are swirling in public discourse at this time. We are required to join the orchestra, each of us taking an instrument, playing the score for the age. In Daniel Wahl’s ambitious work are puzzle pieces that when assembled, let us look at our lives, with feelings of recognition and flashes of insight. This is a prodigious document of enormous breadth presented with gentle respect for existential concepts that will be pondered for all time. ... This book seeks to connect the dots by highlighting the contributions of scores of people past and present whose thoughts help light the way. Daniel challenges us to grapple with the fundamental issues we are facing as individuals and as a species on a planetary scale. Quoting Einstein, Daniel notes that if we fail to state the question correctly we will never be able to come to the correct solution, but if we get the question right then we are very near the answer. Designing Regenerative Cultures comes at an important moment in human history. ... [Its] great accomplishment is the recognition that it will not be sufficient to individually answer the questions posed. The solutions require not simply individual understanding but a shared vision. We need to have a profound conversation that engages everyone and this book is extremely useful in framing the discussion. These are the issues being discussed in the most thoughtful salons on the Earth. You can read, Designing Regenerative Cultures as if the future depended on our understanding this because the future of human civilization will be decided by whether we can transform this profound discussion into collective human consciousness and collective human action." "This is a seriously rich source of perspective on the nature of whole system design. The future is already here and Daniel Wahl has synthesized the wide ranging progress in the emerging field of ‘regenerating wholeness’. There is a lot of positive and effective activity happening around the planet! Of particular note, the title addresses “us” as a significant and often missing leverage point in our work towards regenerative relationships: our cultural ability to become collaborative weavers, integral to evolving a condition of long-lasting health. This book shows the powerful potential of how all these dimensions of wholeness are coming together." "This is an excellent addition to the literature on ecological design and it will certainly form a keystone in the foundations of the new MA in Ecological Design Thinking at Schumacher College, Devon. 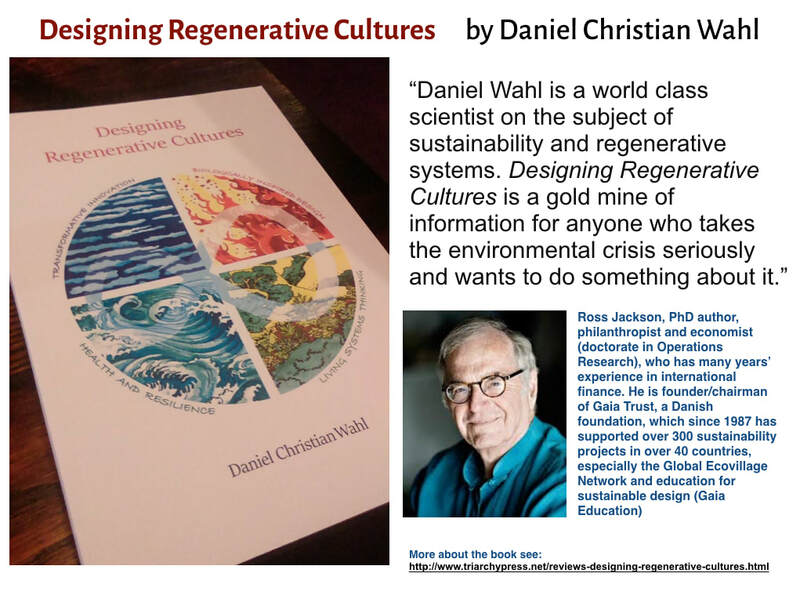 It not only contains a wealth of ideas on what Dr Wahl has termed 'Designing Regenerative Cultures' but what is probably more important, it provides some stimulating new ways of looking at persistent problems in our contemporary culture and hence opens up new ways of thinking and acting in the future. Each Chapter in the book begins with an important question like, "Why Nurture Resilience and Whole Systems Health" (Chapter 4) or "Why Take a Design Based Approach" (Chapter 5) and what follows in each case are a number of suggestions to encourage deeper thinking. This is a very stimulating approach to learning. I am looking forward to using Dr Wahl's book in challenging conversations with colleagues and students." "Living in a text-message culture, Designing Regenerative Cultures is another kind of text message, an essential textbook for our times, filled with resources, references, practices, methods and pathways, and best of all questions we can each live into, alone and together. Our world has benefitted from the contributions of many authors and visionaries, grassroots activists and social entrepreneurs, modern scientists and wise indigenous elders…. ancient and modern intelligence and creativity. And yet, the single-hero journey of brilliant ones can only carry us so far. Today there is a a deep need and longing for a local and global community of care on all levels in all disciplines. Daniel Wahl takes us there in this comprehensive 'manifesto', offering a wholistic picture of a way and a world we can be for, in lieu of the one that seems so headed for destruction. 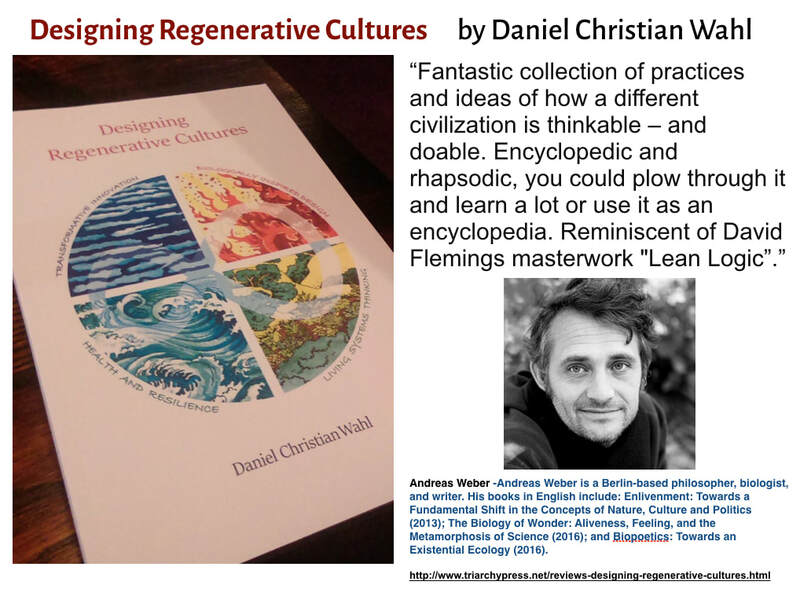 In Designing Regenerative Cultures, Daniel weaves an 'old/new' story helping and I suspect activating, readers to see, respect, learn from and go beyond, as he so clearly has, the great hearts and minds he references throughout. The book contributes to this awakening field as we find ourselves looking through a kaleidoscope of perspectives and teachings - different lenses moving in a spiral together through which to both view and live in our world. It can serve as a foundation for another 'great turn', a directory for next steps worth taking. Many will find inspiration and support to live the way we know we must, to live in the way we know we can if our species is not only to survive, but actually thrive in partnership with all of life." Virginia (Gigi) Coyle, co-author of The Way of Council and The Box: Remembering the Gift ; co-creator of the Ojai Foundation, the School of Lost Borders and Beyond Boundaries. "Worldviews change when existing solutions no longer work and rising problems require new approaches. Designing Regenerative Cultures is a lighthouse charting multiple pathways to the restless, impatient, continuing inquiry of our times, and…. gathering, including and transcending scattered parts of the undivided whole. Time may position Designing Regenerative Cultures as Daniel’s ‘meisterstuck’ and as a must read to all those who are aspiring to be at the forefront of the regenerative (r)evolution." "Kosmos Journal is always looking for those rare individuals who live the worldview they are writing about. We reviewed Daniel Wahl’s book because of its depth and comprehensiveness, just like Daniel himself." Nancy Roof, Founder, Editor, Kosmos Journal and co-founder of the Values Caucus and the Spiritual Caucus at the UN. "Scientists have recently agreed that humans are driving geological changes at an unprecedented rate, catapulting us into a new era coined the "Anthropocene". This immense power also requires immense responsibility to redefine the way we interact with each other and with the other 100 million species on the planet. Daniel Wahl provides an interactive guide for this redefinition, bringing together the most current thinking from several disciplines into one practical guide." "Wahl gives us a profound and deeply thoughtful examination of what it means to design both for the inner and outer dimensions of a human nature in a natural world. I know of nothing else like it."